Today we’re sharing one of our favorite spaces from our Arizona Street of Dreams project. The space was designed for one of our client’s daughters and we were thrilled to be able to give her a fun new bedroom! Our goal for the space was to layer it with items that could grow with her into her tweens and teens. 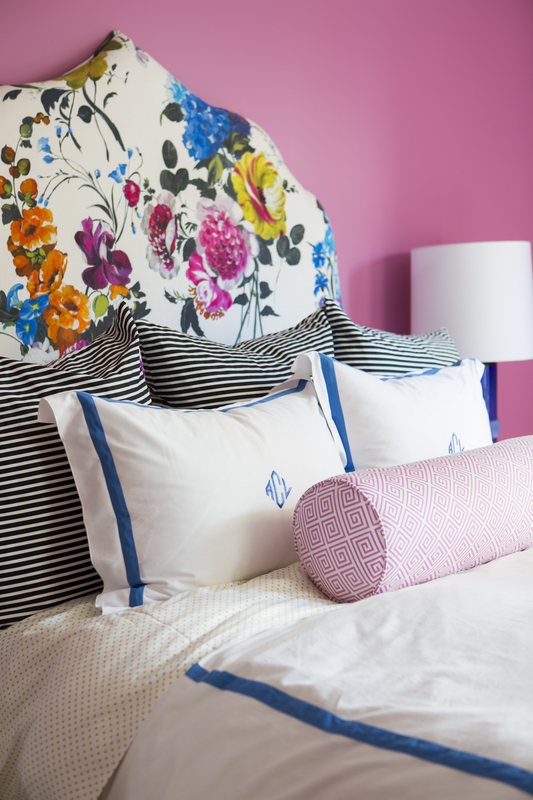 We upholstered the headboard in a large scale floral print and accented it with crisp white bedding with a navy border. Throughout the room we incorporated modern lucite & brass accents to give it a more modern & timeless look. We decided to continue the floral print into the bathroom and it was one of the best decisions we made! 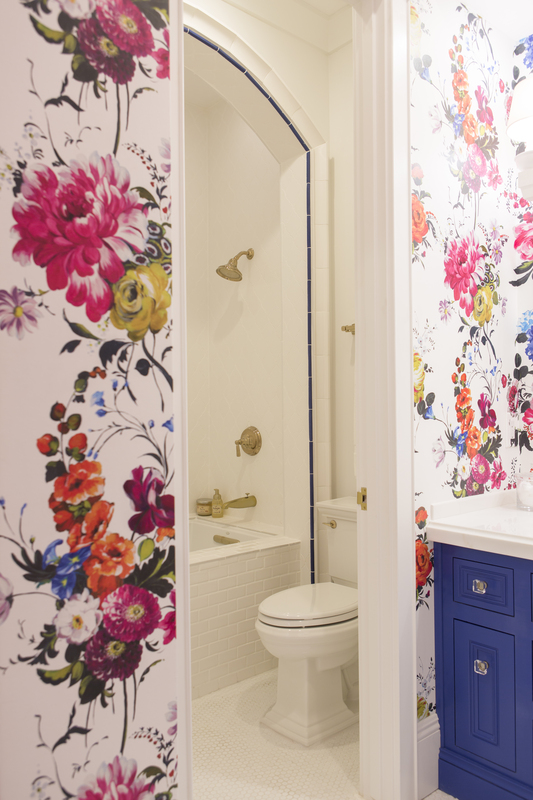 For the vanity, we went with a rich indigo color that compliments the blue tones in the wallpaper. Brass fixtures, lucite drawer pulls and light countertops were the finishing touches to tie the room together. This is gorgeous! Would you mind sharing the name of the floral fabric and wallpaper and where they can be purchased?! the floral print is Designer’s Guild, Amrapali-Peony pattern! 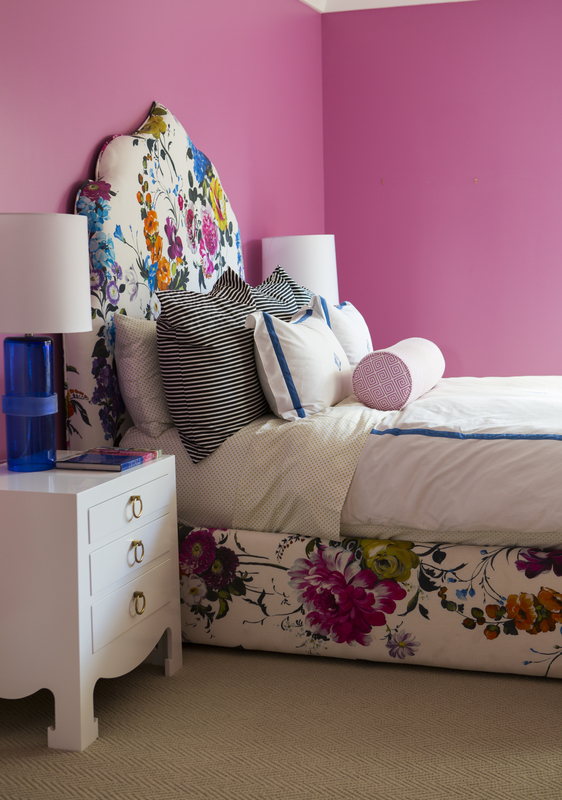 What a fabulously feminine and fun bedroom design! Love this floral print! What is it called and where can I find it? Love the hardware you chose in the bathroom- do you mind sharing your sources? Thanks so much! Soooo Gorgeous! My brother actually lives in the WhiteWing neighborhood you designed the house in. Small world. I would also absolutely love it if you would share your sources for the fabric and wallpaper. Also it’d be amazing if you would share how you went about getting those custom upholstered furniture pieces made. Did you use someone in AZ?? Thank you so much! I look forward to your response!!!? Such a small world!! I’m happy you reached out! 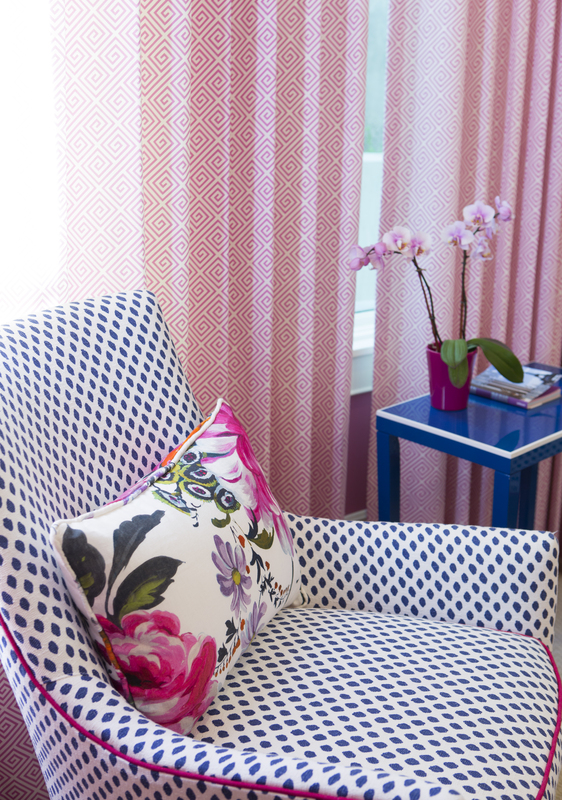 The floral fabric and floral wallpaper is by Designer’s Guild in pattern “Amrapali-Peony”. We purchased the upholstered furniture pieces through Lee Industries and had them upholster the chairs in a custom fabric. Lee Industries sells solely to wholesale purchasers and offers a trade program to interior designers (which is how I was able to purchase through them). If you like the style of their furniture, they make all of Serena and Lily’s furniture which is available on their website. Hope this helps!! So much fun! I would love to know more about the curved curtain rod …. I have a similarly curved wall in my house and it the upstairs master bedroom, I would love to hang drapes like this! Would you share your source? Thanks! Can you please tell me the brand and name of the wall colors ? Love that shade of pink ! This was such a fun bedroom and bathroom. The floral was a BOLD choice and it totally worked! Great job! I love the chairs! Would you mind sharing their fabrics? The chair fabric is Lee Industries, “Sahara Midnight” fabric! This is just perfect, I love the dainty and sophisticated feel of the space – like a jewelry box, really. Fabulous job! I love the layering you did- can share the wall color name/manufacturer? It’s the colorful floral pattern we love…very on trend! This wallpaper is fabulous would you please share the maker? 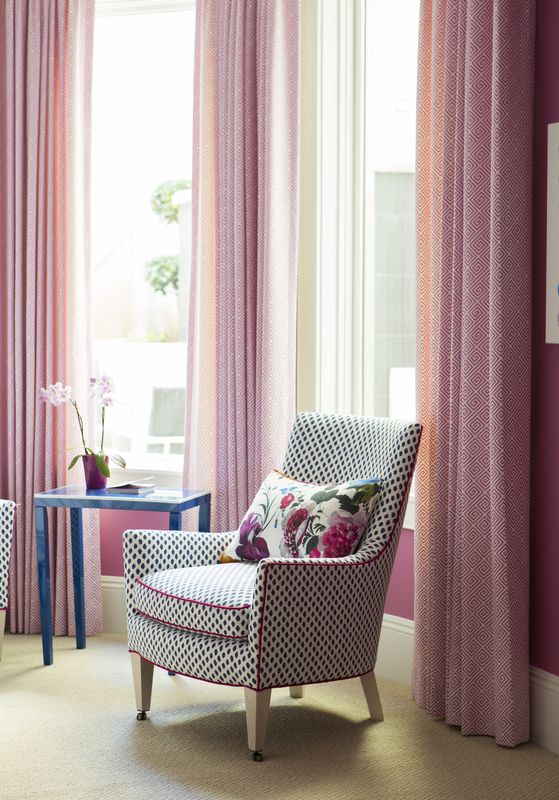 The wallpaper is Designer Guild’s “Amrapali-Peony”! This wallpaper is fabulous, would you mind sharing the source? The wallpaper is fabulous! would you mind sharing the manufacturer? Thank you for the info on the wallpaper. Can you share the brand/color of the indigo vanity?? Thanks so much! I am dying to know what the color is used on the vanity. Do you mind sharing it? Thanks!